Up to £70 Off Womens Boots and Shoes in the Sale at All Saints Make your feet look gorgeous for less with up to £70 off shoes in the sale at All Saints. Free Next Day Delivery on Orders Over £150 at All Saints What a haul! Don't worry, we'll get it to you in no time at no extra cost. Get free next day delivery on orders £150 or more at All Saints. 40% Off Selected Menswear in the Sale at All Saints Save yourself up to 40% off meanswear in the sale at All Saints. Gift Cards from £50 at All Saints Let them treat themselves with gift cards available at All Saints. Up to £125 Off Women's Outlet at All Saints Save yourself a second shopping spree's worth with up to £125 off womenswear in the outlet at All Saints. Free Returns on Orders at All Saints No shame in changing your mind. Especially as there are free returns on orders at All Saints. £90 Off Selected Handbags and Accessories at All Saints Complete your look for less with £90 off accessories and handbags in the sale right now at All Saints. Womens Spring Leathers from £299 at All Saints Find womens spring leathers from £299 at All Saints. Up to 40% Off Men's Coats and Jackets at All Saints We all know British weather is never reliable so grab yourself something that is for less with 40% off select coats and jackets in the sale at All Saints. 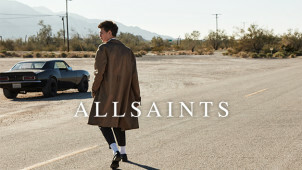 All Saints has become a cult brand with younger people who want classy yet slightly edgy style. With premium quality and high end looks, it blends designer chic with urban style to give you wearable pieces that really define the latest trends. Get more of their sophisticated style for less with vouchercloud. For both men and women, you can get some truly unique and interesting things at All Saints, with some highlights being their leather collections and their classic bags. With new deals and offers added as soon as they are made available by the brand, you can get some amazing deals on unbeatable style and quality when you keep informed about All Saints' offers. How do I use my All Saints discount code? Click ‘Apply’ and then ‘Proceed to Checkout’ to continue and complete the transaction. Subscribe to the newsletter to stay up to date on the latest trends as well as to receive great discounts and offers straight to your inbox. Does All Saints sell Gift Cards? AllSaints sells physical gift cards which can be credited with any amount from £20 to £2000. These are sent out in stylish AllSaints gift boxes, which make them an attractive gift in their own right to receive! Gift cards can be used online and also in All Saints stores, though they cannot be used in department stores that have AllSaints concessions, or to buy more gift cards. Where is my nearest All Saints branch? All Saints have plenty of locations around the UK, including some outlet branches. You can use the store locator to find your nearest ones. What size should I order at All Saints? AllSaints is a great store for women who are looking for smaller sizes, as they start at a UK size 2 and go up to a UK 14. You can find size conversions to other international sizes as well as menswear sizing here. Can I get All Saints free delivery? Yes, when you spend over £150 online. Next Day Delivery costs £4.95 otherwise. Pre-10:30am Delivery is also available for £9.95. Saturday and Sunday Delivery are also available for £9.95. Items must be returned within 14 days of arriving - simply apply the freepost label to your package and take to your local Post Office. Items can be returned in-store for an exchange or giftcard only. You can also reach All Saints online via their contact form. All Saintsis a brand synonymous with fresh, young, London style. Now with branches all over the UK and online retail all over the world, the brand has stayed close to its cool, alternative London roots with the name of its original location in Spitalfields still a big part of the brand. When you fetch yourself the latest All Saints discount code here at vouchercloud, you can save money on their stylish clothing for men and women. From partywear to great urban style for every day, All Saints offers smart, sophisticated looks you will love. Every month All Saints adds a new 'lookbook' to their website, with stunning fashion photography that shows great ways to wear the clothes in their current collections and can give some interesting style inspiration. Get into the zeitgeist and find out what’s trending as the months warm up, by checking out these lookbooks. They’ll help you put together great All Saints pieces to create surprising and attractive on-trend outfits. All Saints has a special range called All Saints Limited that features limited edition items with special craftsmanship. Here you will find cutting edge styles in high-end materials like leather and cashmere, in designs to fit the latest trends. Shop around with an All Saints promo code if you want something extra special or are just looking for some ideas — this is a great part of the general All Saints range to spend some time checking out.